I would again reiterate that this blog is not intended to form doctrine for any denomination, or to express personal opinions. Its purpose is to show the parallels of the Gospels and the New Revelation. It is quite evident from this and prior posts that they have many parallels, with more explanation in the New Revelation. At times Jesus punctuated his teachings about God as the Father with miracles of healing which he performed. In this instance he performed a nature miracle. The accounts in the Gospel and the New Revelation are similar, with some additional detail available in the New Revelation. This happened at the end of the third preaching tour of Galilee, and also at the time Jesus began to teach in parables, ever mindful of his enemies desire to trip him up when teaching. 1 Some time after this, Jesus crossed to the far shore of the Sea of Galilee (that is, the Sea of Tiberias), 2 and a great crowd of people followed him because they saw the signs he had performed by healing the sick. 3 Then Jesus went up on a mountainside and sat down with his disciples. 4 The Jewish Passover Festival was near. Jesus knew that the evil inside had to be eradicated, as the choice thereof became sin, and sin destroyed human lives from within. He further knew that if people could achieve faith In God as a Father as the cure for sin, they would have a way to not only combat this internally debilitating condition, but be permanently healed of it. He had the power to both heal and forgive sin, and often did so in the case of women. In his time, women were in many ways treated as chattels owned by their husbands. They sat in a special section in the synagogues. There were no battered women agencies. This is a situation which continues in many Middle Eastern countries today. The Bible and the New Revelation both report parallel instances where Jesus directly healed or forgave women of their sins and they were healed, and they entered his spiritual kingdom where they began their lives anew, in joy. Probably the most famous examples of this healing are Mary Magdalene and the Brothel Madam of Jerusalem. There are many more reported, such as the harlot he saved from being stoned when he wrote in the sand, the old woman bent over in the Synagogue, the Samaritan woman at Jacob’s well, and the woman who touched his cloak and was healed of her bleeding. He also commissioned a women’s corps to travel with he and the apostles, and they both taught and ministered to sick women. Mary Magdalene was amongst them. Not one ever deserted Jesus. Jesus elevated all women to equal spiritual and social status with men. 9 When Jesus rose early on the first day of the week, he appeared first to Mary Magdalene, out of whom he had driven seven demons. 41 In Galilee these women had followed him and cared for his needs. Many other women who had come up with him to Jerusalem were also there. 150.2.2 It was at Magdala that the women first demonstrated their usefulness and vindicated the wisdom of their choosing. Andrew had imposed rather strict rules upon his associates about doing personal work with women, especially with those of questionable character. When the party entered Magdala, these ten women evangelists were free to enter the evil resorts and preach the glad tidings directly to all their inmates. And when visiting the sick, these women were able to draw very close in their ministry to their afflicted sisters. As the result of the ministry of these ten women (afterward known as the twelve women) at this place, Mary Magdalene was won for the kingdom. Through a succession of misfortunes and in consequence of the attitude of reputable society toward women who commit such errors of judgment, this woman had found herself in one of the nefarious resorts of Magdala. It was Martha and Rachel who made plain to Mary that the doors of the kingdom were open to even such as she. Mary believed the good news and was baptized by Peter the next day. 150.2.3 Mary Magdalene became the most effective teacher of the gospel among this group of twelve women evangelists. She was set apart for such service, together with Rebecca, at Jotapata about four weeks subsequent to her conversion. Mary and Rebecca, with the others of this group, went on through the remainder of Jesus’ life on earth, laboring faithfully and effectively for the enlightenment and uplifting of their downtrodden sisters; and when the last and tragic episode in the drama of Jesus’ life was being enacted, notwithstanding the apostles all fled but one, these women were all present, and not one either denied or betrayed him. 147:5.3 On this particular occasion at Simon's house, among those who came in off the street was a woman of unsavory reputation who had recently become a believer in the good news of the gospel of the kingdom. This woman was well known throughout all Jerusalem as the former keeper of one of the so-called high-class brothels located hard by the temple court of the gentiles. 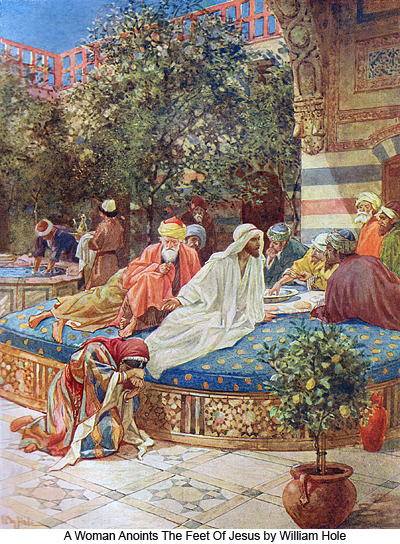 She had, on accepting the teachings of Jesus, closed up her nefarious place of business and had induced the majority of the women associated with her to accept the gospel and change their mode of living; notwithstanding this, she was still held in great disdain by the Pharisees and was compelled to wear her hair down—the badge of harlotry. This unnamed woman had brought with her a large flask of perfumed anointing lotion and, standing behind Jesus as he reclined at meat, began to anoint his feet while she also wet his feet with her tears of gratitude, wiping them with the hair of her head. And when she had finished this anointing, she continued weeping and kissing his feet. 147:5.4 When Simon saw all this, he said to himself: "This man, if he were a prophet, would have perceived who and what manner of woman this is who thus touches him; that she is a notorious sinner." And Jesus, knowing what was going on in Simon's mind, spoke up, saying: "Simon, I have something which I would like to say to you." Simon answered, "Teacher, say on." Then said Jesus: "A certain wealthy moneylender had two debtors. The one owed him five hundred denarii and the other fifty. Now, when neither of them had wherewith to pay, he forgave them both. Which of them do you think, Simon, would love him most?" Simon answered, "He, I suppose, whom he forgave the most." And Jesus said, "You have rightly judged," and pointing to the woman, he continued: "Simon, take a good look at this woman. I entered your house as an invited guest, yet you gave me no water for my feet. This grateful woman has washed my feet with tears and wiped them with the hair of her head. You gave me no kiss of friendly greeting, but this woman, ever since she came in, has not ceased to kiss my feet. My head with oil you neglected to anoint, but she has anointed my feet with precious lotions. And what is the meaning of all this? Simply that her many sins have been forgiven, and this has led her to love much. But those who have received but little forgiveness sometimes love but little." And turning around toward the woman, he took her by the hand and, lifting her up, said: "You have indeed repented of your sins, and they are forgiven. Be not discouraged by the thoughtless and unkind attitude of your fellows; go on in the joy and liberty of the kingdom of heaven." 147:5.5 When Simon and his friends who sat at meat with him heard these words, they were the more astonished, and they began to whisper among themselves, "Who is this man that he even dares to forgive sins?" And when Jesus heard them thus murmuring, he turned to dismiss the woman, saying, "Woman, go in peace; your faith has saved you." 147:5.6 As Jesus arose with his friends to leave, he turned to Simon and said: "I know your heart, Simon, how you are torn betwixt faith and doubts, how you are distraught by fear and troubled by pride; but I pray for you that you may yield to the light and may experience in your station in life just such mighty transformations of mind and spirit as may be comparable to the tremendous changes which the gospel of the kingdom has already wrought in the heart of your unbidden and unwelcome guest. And I declare to all of you that the Father has opened the doors of the heavenly kingdom to all who have the faith to enter, and no man or association of men can close those doors even to the most humble soul or supposedly most flagrant sinner on earth if such sincerely seek an entrance." And Jesus, with Peter, James, and John, took leave of their host and went to join the rest of the apostles at the camp in the garden of Gethsemane. 147:5.7 That same evening Jesus made the long-to-be-remembered address to the apostles regarding the relative value of status with God and progress in the eternal ascent to Paradise Said Jesus: "My children, if there exists a true and living connection between the child and the Father, the child is certain to progress continuously toward the Father's ideals. True, the child may at first make slow progress, but the progress is none the less sure. The important thing is not the rapidity of your progress but rather its certainty. Your actual achievement is not so important as the fact that the direction of your progress is Godward. What you are becoming day by day is of infinitely more importance than what you are today. 147:5.8 "This transformed woman whom some of you saw at Simon's house today is, at this moment, living on a level which is vastly below that of Simon and his well-meaning associates; but while these Pharisees are occupied with the false progress of the illusion of traversing deceptive circles of meaningless ceremonial services, this woman has, in dead earnest, started out on the long and eventful search for God, and her path toward heaven is not blocked by spiritual pride and moral self-satisfaction. The woman is, humanly speaking, much farther away from God than Simon, but her soul is in progressive motion; she is on the way toward an eternal goal. There are present in this woman tremendous spiritual possibilities for the future. Some of you may not stand high in actual levels of soul and spirit, but you are making daily progress on the living way opened up, through faith, to God. There are tremendous possibilities in each of you for the future. Better by far to have a small but living and growing faith than to be possessed of a great intellect with its dead stores of worldly wisdom and spiritual unbelief."